Not to be confused with Marine Forces Atlantic. 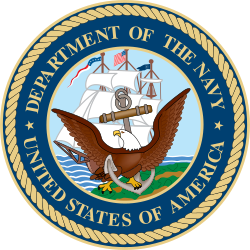 The official seal of the United States Department of the Navy. Reporting directly to the Commanding General, Fleet Marine Force, Atlantic (CG FMFLANT) are the Commanding General, II Marine Expeditionary Force (MEF), the Commanding General, 2nd Marine Expeditionary Brigade (MEB), and the Commanding Officers of three Marine Expeditionary Units (22d, 24th, 26th MEUs). The Commanding General, II MEF, exercises operational control over the 2d Marine Division, the 2d Marine Aircraft Wing, and the 2d Marine Logistics Group.